Sometimes the built in speakers on your phone and tablets just don’t cut it for the sound you want to hear. That’s why more wireless bluetooth speakers are becoming available. Not too long ago I did several reviews of wireless bluetooth speakers, which had good sound and a little bass. 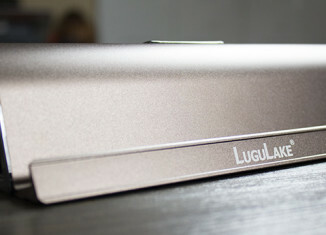 Now I thought it was time to check out a new player that is hitting the market, the LuguLake bluetooth speaker. Out of the box you’ll get the LuguLake bluetooth speaker, which has two 3W speakers (one on each end). You’ll also get an auxiliary cable for those times you need to conserve battery or are using a device without bluetooth support. To recharge the built in 1000 MAH battery, you get a USB charging cable but no wall adapter. So you will have to use one you have for other devices, charge it through your computer, or buy one. The LuguLake speaker currently comes in coffee, silver, and blue colors according to Amazon. The LuguLake speaker is shaped like a tube with a stand on the front for your phone, tablet, or iPod. It measures 7.9 x 2 x 2 inches and weighs just 14.1 ounces. The slot for your device is thick enough for probably any device without any type of case on it. The only thing is there is no protection between the metal and your device which makes me cringe. I would suggest putting some type of felt or thin foam inside the slot to keep from metal on metal or plastic and limit scratches. One good thing about the metal finish is that it is fingerprint resistant which makes it easy to keep clean. On each end of the tube you’ll find a 3 watt speaker and grill instead of on the front like most speakers or docks. For the controls and connections, you’ll find them on the back side which consists of the power switch, auxiliary input, and DC input for power. There is also a small LED light that flashes blue twice if connected to bluetooth and blue/red when in pairing mode. Keep in mind this is just a speaker, so there are no extra volume controls or built in microphone for calls. I was very skeptical about trying out this little speaker, especially with a name I hadn’t yet heard of. That feeling changed quickly as soon as I connected it to my phone and turned on my playlist. Of course the sound was dramatically better than the built in speaker of the Samsung Galaxy S4 or the iPad Air. But as soon as I heard the music play, I could tell how clear and crisp the sound was along with the adequately added bass for such small speakers. I just didn’t realize how much better the LuguLake speaker was until I started switching back and forth between it and the Kitsound Boombar speaker. One concern I still have is how it would sound if the speakers faced the front instead of the sides. Either way, the sound is phenomenal for this small setup. Don’t get me wrong, it’s not a high end sound system by any means. For the price, however, it is definitely a top contender for the range it is in.